My mum came into my room on Tuesday morning and told me to "prepare myself for a shock". I immediately thought my grandfather had died or been taken more seriously ill. In retrospect, awful though it sounds, I would have taken it better if that was what had happened. She told me John Lennon had been shot. I replied, "how is he?" and she slowly shook her head and said "he isn't - he's dead." What? John? The most important man in the world to my life at that time? The Beatle? The Walrus ?? The man whose new LP I had queued around the corner to buy just a few weeks ago? Dead? My head couldn't take it in. I sat on the floor with my radio and tuned from station to station...why were they all playing Imagine? Ah..7.30 - the news...no, I don't want to hear that, find another station...no...another - and so on as the news began to sink into my reality. I made a shrine in my bedroom window. I hung up my electric guitar and surrounded it with LP covers. I went out and bought every English newspaper (to my utter regret a few weeks later I cut them up to make a collage for my bedroom wall - each newspaper is now worth a fortune !). I got to school VERY late. My friend and I offered to spend Wednesday afternoon (general studies period) in the school Music Room playing John Lennon records for other fans to show their respect. We were told to do two songs live for every record played (I was a singer/pianist/guitarist, he a pianist). So we booked the room and advertised the event. 15 minutes before the event on Wednesday we had to move to the school hall ! I recall rows of girls in Beatles scarves wearing round John Lennon specs in floods of tears as Colin and I played Across the Universe, If I Fell, Imagine, Isolation and others. It was my first gig. It helped me grieve yet gave me such a feeling of pride that I could share John's music in this way - and that so many others amongst my school friends felt the same grief. Mark David Chapman was, actually, a very nice young man. A massive Beatles fan and especially of John. To some extent he had even modeled himself on his hero - as so many of us have done over the years. He was a good, clean living young man who taught in his local Sunday School. Then (on my birthday ! ), Oct 9th 1975 Sean was born after a very long struggle by John and Yoko to conceive and carry a baby full term (Yoko had had several miscarriages, of course). John was the proudest parent there could ever be. He knew he had made mistakes in the fatherhood of Julian and promised himself he would not make the same mistake again this time around. No being away on long tours, coming home and finding his son another couple of inches taller - no missing out on first smiles, first words etc. His EMI contract almost at an end he felt free - free from contracts, free from expectations and no burden on him to sing or record ever again unless he wanted to. So he didn't. John stayed at home and looked after the baby while Yoko multiplied the family fortune through careful business investments. John changed the nappies (diapers), John sang Sean to sleep, John danced with him to stop him crying. John cooked the bread...John was doing what he wanted to do - be a daddy ! Chapman started booking into hotels as John Lennon. He booked airline tickets too. 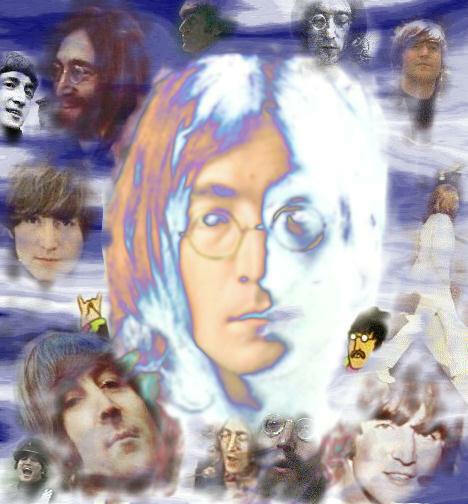 As he descended into a form of schizophrenia he was actually starting to believe he was John Lennon. And he was happy...and the world still missed John, the 'loony ex-Beatle locked away in the austere Dakota buildings near Central Park.' The man who had said (according to the press) "I have made my contribution to society"
Then Sean started school and who needs a full-time househusband. While on holiday in Bermuda (?) John started thinking about making another record. he had listened to the radio playing the New Wave music of 79/80. He knew that if the world could put Lene Lovich in the charts then they could also listen to Yoko (at last). he sang his new ideas for songs over the phone to Yoko - she had thought the same and sang her songs back...and the world welcomed John Lennon back into the fold and bought his new album Double Fantasy. The single, Starting Over hit the charts too. And Mark Chapman, like any John Lennon fan bought the album. And they say he liked it...but he knew it wasn't him...and if John Lennon was back in the world - where did he fit in? With his mental decline in freefall he fed its fever by reading and rereading JD Salinger's 'Catcher in the Rye'. Swinging moment by moment between being John Lennon's biggest fan and seeing his oft-time hero as some sort of grotesque impostor he bought another airline ticket to New York. He stood as so many fans had done before him in the shadow of the Dakota and waited for a glimpse of his god and was rewarded with a signature on his copy of Double Fantasy. In his own way, John Lennon had signed his own death warrant for, as he got into the car which would take he and Yoko to their final recording session Chapman proudly clutched his prize...and waited. crime statistic and bundled him into the back of the car and headed for the hospital. Part way there one of the two police officers looked around and thought he recognised their passenger. As he asked "Are you John Lennon?" the barely conscious John vaguely nodded and muttered a final "Yeah". And the whole world mourned. Starting Over hit number one, closely followed by Imagine. Tributes poured out like New Year's Eve champagne. As so many discovered that month - you don't know what you got - until you lose it.